My kids reading habit, although awesome, is going to be a big problem in about 4 weeks when these two night owls need to get up and on the bus. Owen wraps his book light around his neck, and reads until he can't keep his eyes open anymore. He's been reading Harry Potter this summer. For a long time, he didn't want to read the series, stating that he was "more into Greek gods than wizards." Not so much anymore! 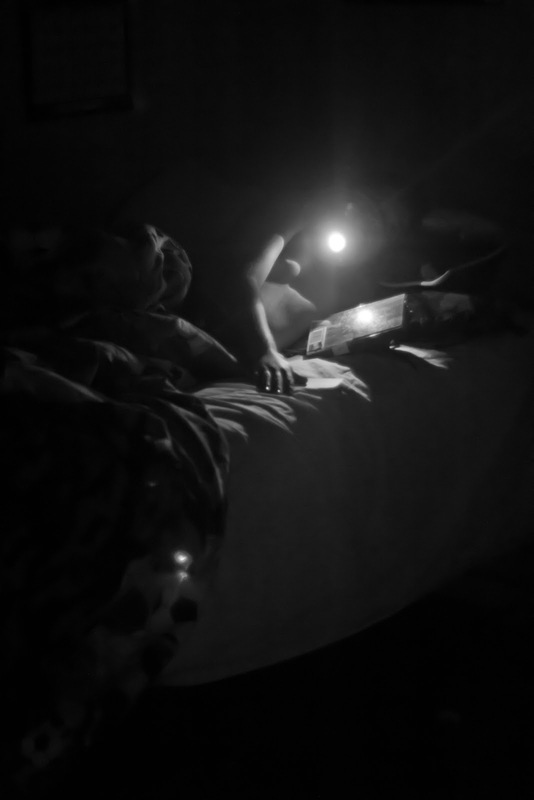 Sophia just grabs whatever book is nearby and "reads" to her babies until I come in and shut the light off for her. Such a good mommy, reading to her kiddos. I wonder if she get so tired that she ends up reading them gibberish, like I occasionally do? Only one month left of the loosely enforced bedtime routine. Then we get down to business! It makes me sad to see summer come to an end. It's bittersweet that so soon, my little readers will spend most of their days away from me and The Compound.